Depositing and sharing research data is at the core of open science practices. However, institutions in the long tail of science are struggling to properly manage large amounts of data. 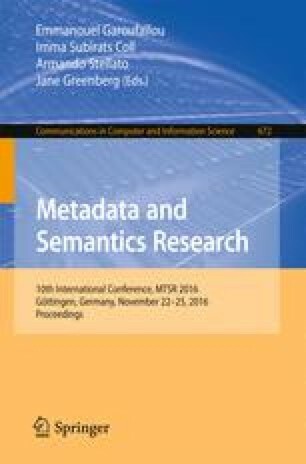 Support for research data management is still fragile, and most existing solutions adopt generic metadata schemas for data description. These might be unable to capture the production contexts of many datasets, making them harder to interpret. EUDAT is a large ongoing EU-funded project that aims to provide a platform to help researchers manage their datasets and share them when they are ready to be published. DataPublication@U.Porto is an EUDAT Data Pilot proposing the integration between Dendro, a prototype research data management platform, and the EUDAT B2Share module. The goal is to offer researchers a streamlined workflow: they organize and describe their data in Dendro as soon as they are available, and decide when to deposit in a data repository. Dendro integrates with the API of B2Share, automatically filling the standard metadata descriptors and complementing the data package with additional files for domain-specific descriptors. Our integration offers researchers a simple but complete workflow, from data preparation and description to data deposit. This work is financed by the ERDF—European Regional Development Fund through the Operational Programme for Competitiveness and Internationalisation - COMPETE 2020 Programme and by National Funds through the Portuguese funding agency, FCT - Fundação para a Ciência e a Tecnologia within project POCI-01-0145-FEDER-016736.